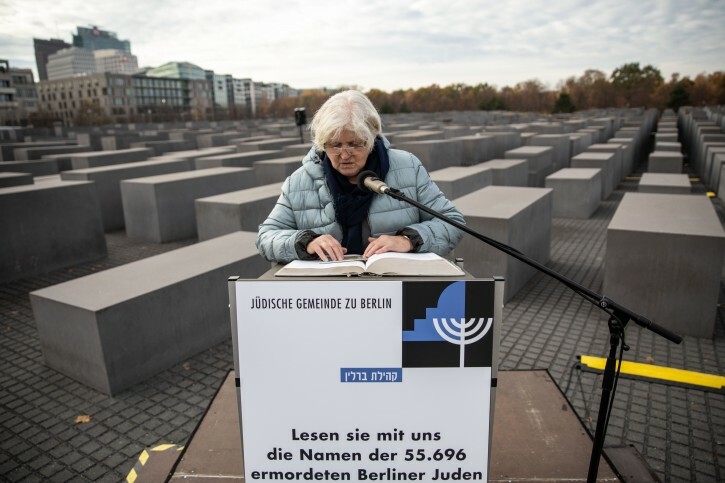 A teenager reads the names of Jewish victims from Berlin, that were murdered in the Holocaust, at the Holocaust Memorial in Berlin, Germany, 08 November 2018. 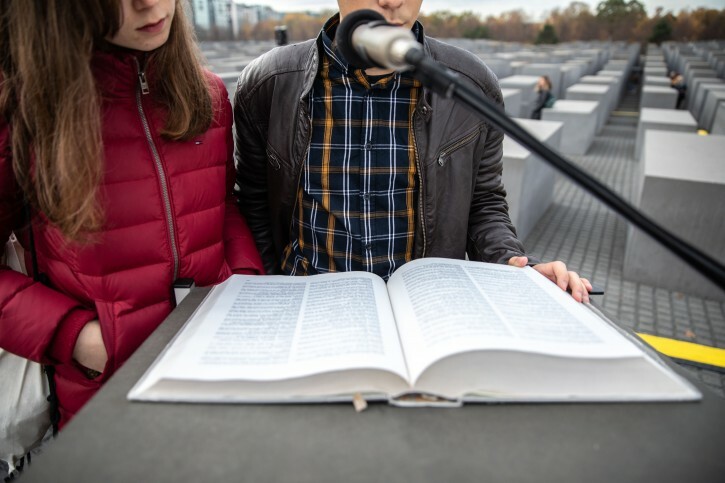 Berlin - Dozens of students from Berlin’s Jewish high school read aloud the names of 55,696 Jews from that city murdered during the Nazi regime. 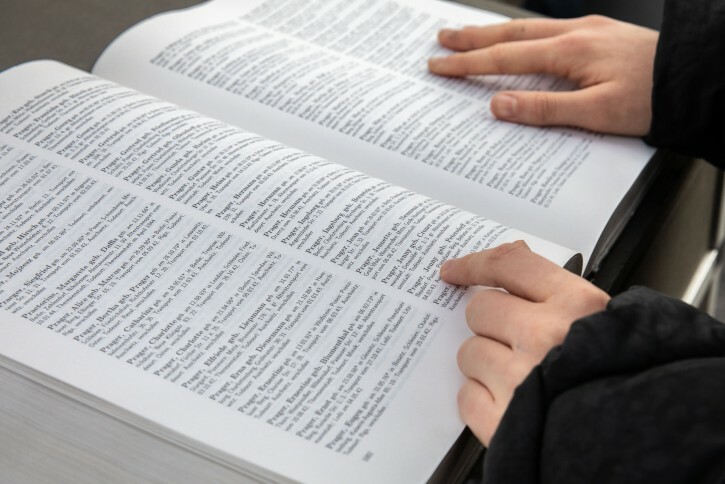 The reading on Thursday was one of numerous events in the capital and across the country marking the 80th anniversary of Kristallnacht, the anti-Jewish pogrom of Nov. 9-10, 1938. It began at 10 a.m. at Germany’s memorial to the murdered Jews of Europe. Kristallnacht is commonly considered a violent turning point leading up to the Holocaust. The “Night of Broken Glass” took the lives of nearly 100 German Jews and led to the arrest of some 30,000 Jews who were sent to concentration camps. Some 250 synagogues were destroyed. At the Holocaust memorial, an eighth-grader named Rosa told JTA it was important to participate in the reading. “Not enough people are interested, and we have to remember,” she said after stepping down from the podium. There were 22 loudspeakers set up throughout the field of 2,711 concrete slabs. The names read by the students echoed across the memorial. Institute will introduce its “1938 Project – Posts from the Past,” which presents personal documents of Jewish eyewitnesses to persecution. Other memorial events included a ceremony on Thursday with the Berlin Senate, leaders of the Berlin Jewish community and a presentation by students from the Jewish high school, as well as a wreath-laying ceremony at the Topography of Terror memorial on the site of the former Gestapo headquarters. Among those attending the commemoration in Berlin was a delegation of the North American Board of Rabbis, which sponsors an exchange program between American Jewish teens and their non-Jewish counterparts in Germany.